A favorite photograph, BADLANDS X, has been juried into an upcoming international show with PRAXIS Gallery and Photographic Arts Center in Minneapolis, MN. 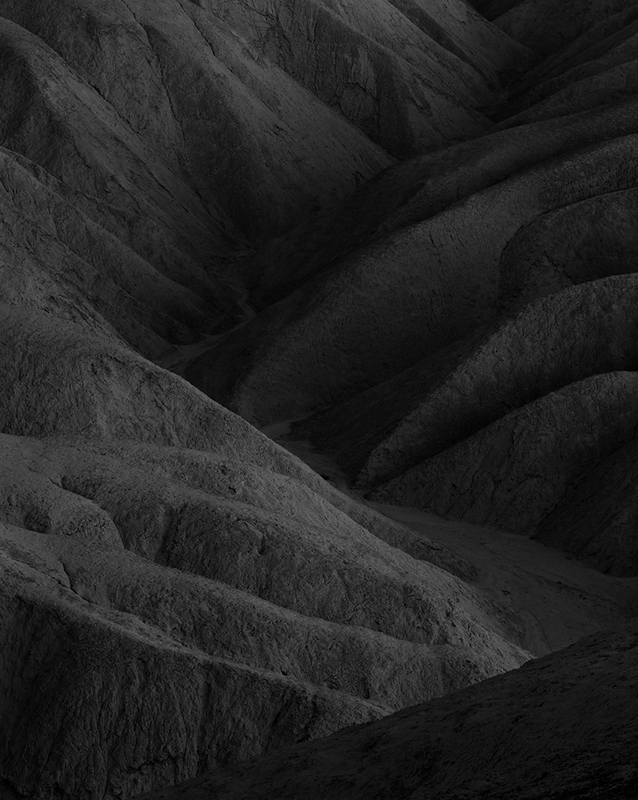 ...This photograph was made at Zabriskie Point, in Death Vally National Park. It's a spot where every tour bus stops. EVERY photographer who has been to Death Valley has a photo of the actual point of Zabriskie. Not me, though, because I refuse to photograph heavily photographed subjects. Literally right next to where literally dozens of photographers line up literally every day to shoot Zabriskie at sunset, sits acres upon acres of the most beautifully fluted, meandering badlands. It is littered with endless compositional possibilities...the chance to apply yourself as an artist to this scene, which is so often overlooked (pun intended), yet most who visit are just there to collect an image of Zabriskie Point. I guess maybe that was just one reason, with a few added side notes. Oh, also, it's moody as all get-out, and I get my money's worth out of silver when printing it. You can view the preliminary exhibit catalogue HERE. Here's a snippet about the show, titled Shadow Aspect: "Most people think that shadows follow, precede, surround beings or objects. The truth is that they also surround words, ideas, desires, deeds, impulses and memories.’ – Elie Wiesel. Praxis Gallery seeks the submission of photographic art that explores the formal, conceptual and metaphoric implications of the shadow. Submissions may focus on the shadow as pure visual form expressed through the creation of line, shape, pattern and texture. They may also examine the cultural and psychological implications of the shadow - exploring ideas of foreboding, internal conflict, passages into the unconsciousness, or other ephemeral interpretations. Shadow Aspect is on exhibit from January 19th-February 14th. Map below.